The year was 1822. The place, Benjamin Brown's shed. There, a piece of history was born in the form of a bass drum. The drum was purchased by the remnants of a group called the Old Militia of Westchester, led by Colchester's own retired war hero, Colonel Champion. Champion was famed for his success in supplying Washington's continental army with greatly needed beef and rations during the cold winter at Valley Forge. Other drum corps in Colchester used the drum including: The Awakes, in the 1860s; and The Boys in Blue, during the 1870s. 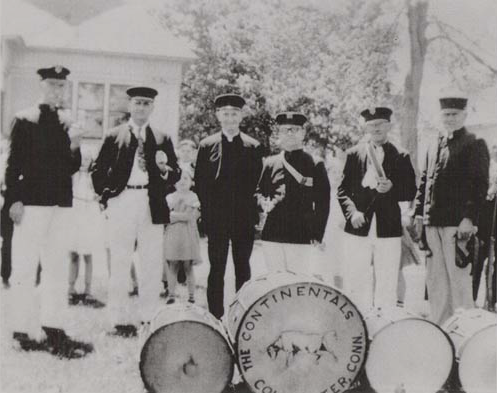 Around the turn of the century, the Colchester Drum Corp, which soon after became the Continentals, used this and a collection of other Brown drums. The steer on the side of the old Brown drum (the original Continentals logo) is believed to be a reference to General Champion's pivotal success at delivering the beef during the toughest part of the Revolutionary War. It is unclear when the Continentals stopped playing (possibly around the time of the Second World War). Copyright © 2014 Colchester Continentals. All rights reserved.